EUGENE, Ore. – The No. 2 Arkansas’ women’s track and field team continues its postseason with competition at this week’s NCAA Championship which begin Wednesday and run through Saturday at Hayward Field in Eugene, Ore. In what could be a tight race for the team title, the Razorbacks enter the meet with 17 national qualifiers in 10 events, good for the second-highest total in the country. The Arkansas women return 11 from last year’s team that had a top-10 finish with 21.5 points at the 2014 outdoor national meet. In the program’s history, the Razorbacks have posted four top-10 team finishes with their best result coming in 2001 with a fifth-place finish behind 31 points. Competing on the nation’s biggest stage for track and field, the Razorbacks are looking to build on their indoor success that featured the program’s first NCAA team title and three event champions. 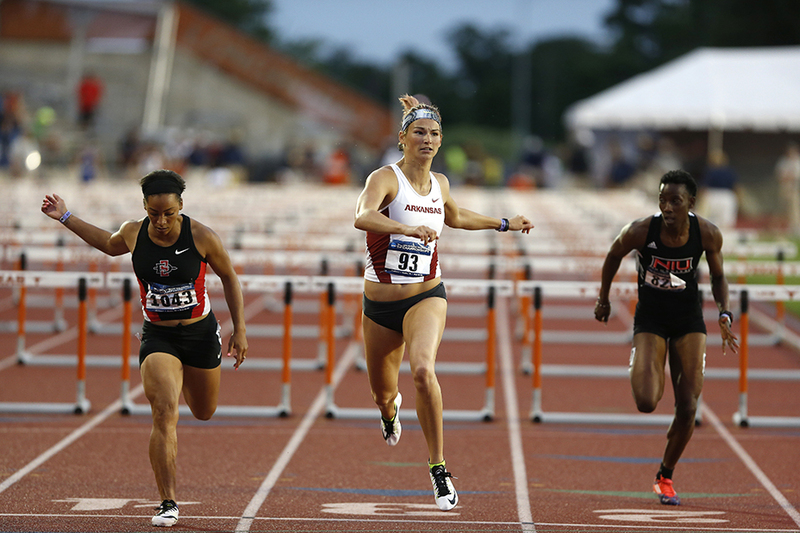 Following a strong showing at the NCAA West Preliminary, the Razorbacks have six events with multiple qualifiers with two in the heptathlon, 100-meter hurdles, 800 meter, 3,000-meter steeplechase and 10,000 meter and three entered in the pole vault. Additionally five Razorbacks are double qualifiers with Dominique Scott competing at 5,000 and 10,000 meters, Taylor Ellis-Watson at 400 meters and in the 4×400-meter relay, Chrishuna Williams at 800 meters and in the 4×400-meter relay, while the multi duo of Alex Gochenour and Taliyah Brooks look to score in the heptathlon and 100-meter hurdles. Williams is the lone outdoor NCAA champion on the talented roster, having won a title in 2013 with the 4×400-meter relay alongside Gwendolyn Flowers, Regina George and Sparkle McKnight in a school-record time of 3:27.09. She returns to the relay event this year and looks for her first individual national title at 800 meters where she has the No. 2 time in the country at 2:01.61. As part of the only women’s action Wednesday, Brooks and Gochenour open competition on day one in the heptathlon at 11 a.m. (CT). The remainder of events will be held Thursday and Saturday with the new format changing to gender-specific days of competition. The NCAA Outdoor Championships will be more visible than ever before with 12 hours of television coverage on the ESPN family of networks with additional online streams dedicated to the multi and field events.